Tom was a Scottish journalist who lived in New Zealand from 1973 until his death. Living in Wellington he was best known as the tarot card reader at Wakefield market. Told that he might have only nine months to live, Tom decided to make the most of whatever was left to him – and he took up flying. Tom is the author of the book If I Should Die, the story of his journey with HIV and AIDS; not only of his fight against HIV but also of his battle against the bigotry and prejudice that stopped him flying and almost drove him out of business. It is not a story about dying. It is a story about living. “Remember my story about the garden. It’s spring. You hold a tiny kitten in your hand and tell me how each form of life, no matter how small, is part of life itself, struggling to see its part in the plan, and is to be loved and respected. …When we understand space and time, we’ll know that in infinity all we have is here and now. And sometimes in the here and now, you’ll turn a corner to find a little garden. We’ll sit down together under a spring sun, and watch the kitten and the caterpillar. And I’ll tell you again about the butterflies. 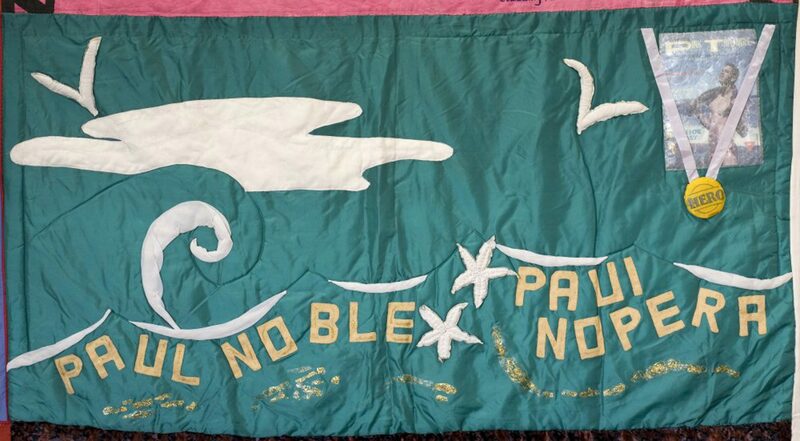 This panel was presented to the New Zealand Quilt Project by Libby Woodham, Convenor of the Australian Quilt Project on October 5, 1991. 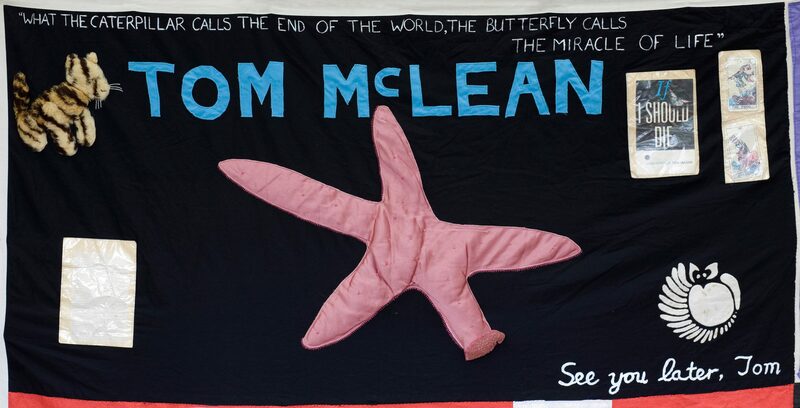 An identical one is part of the Australian Quilt Project. Andrew was born in Perth, Western Australia. He trained as a school teacher and taught in Western Australia in the 70’s. After a stint living in the USA and Canada, he arrived in Sydney in the early 80’s. Andrew worked for Qantas for many years but was forced to retire due to ill health in 1989. In 1984 he was diagnosed HIV positive. He became involved in many support organisations for people living with AIDS and was one of the co-founders of the Community Support Network and People Living with AIDS. 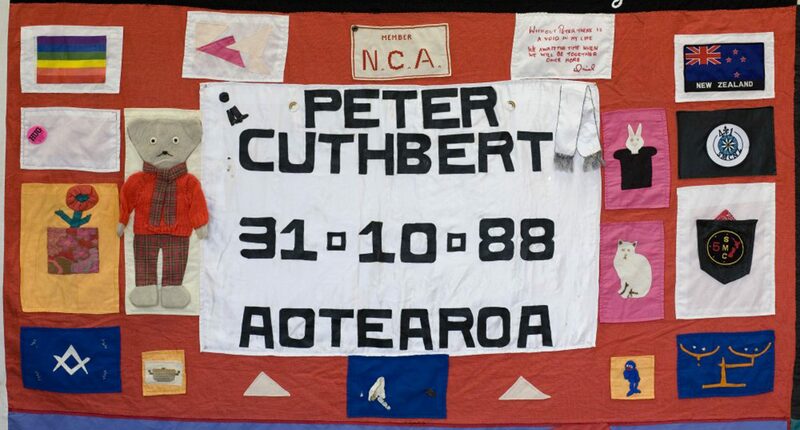 His most prominent role has been as the co-founder of the Australian AIDS Memorial Quilt Project which he founded with Richard Johnson in September 1988. 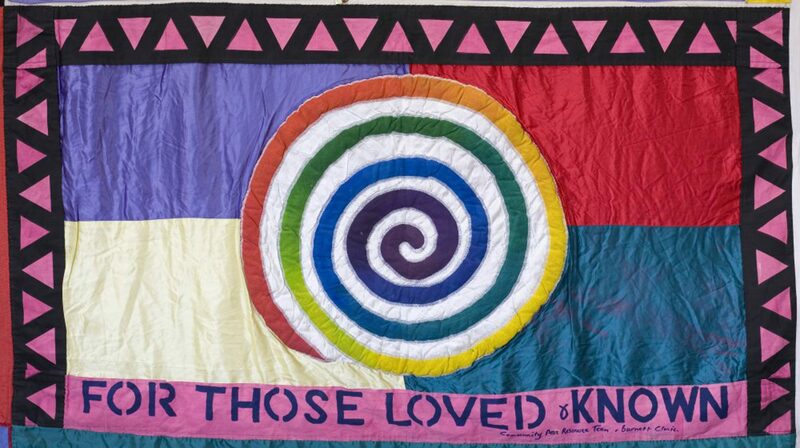 The Quilt was launched on World AIDS Day 1988 by Ita Buttrose. Andrew worked tirelessly to promote the Quilt Project. He took part of the Quilt to the 5th International Congress on AIDS in Montreal, in June 1989. There he made a speech where he was able to read out a letter of support for the Quilt written by our Prime Minister, Bob Hawke. 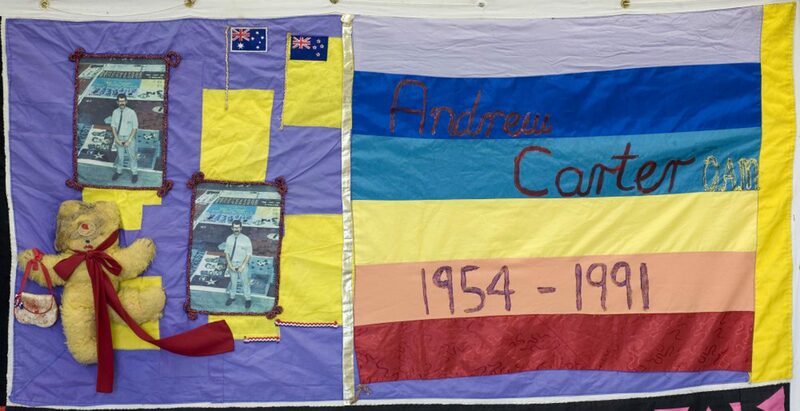 In October 1989, Andrew and the Quilt received the AIDS Trust Award for outstanding service to community awareness of the AIDS epidemic. Throughout 1990, Andrew succumbed more and more to the devastating effects of AIDS. 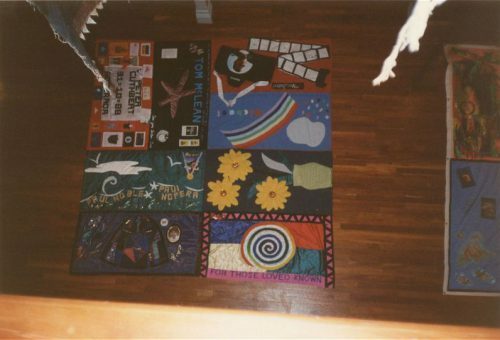 In March 1990, he had to resign from the Quilt to concentrate his energies on his own failing health. He still kept in close contact with the ever-expanding Quilt activities. 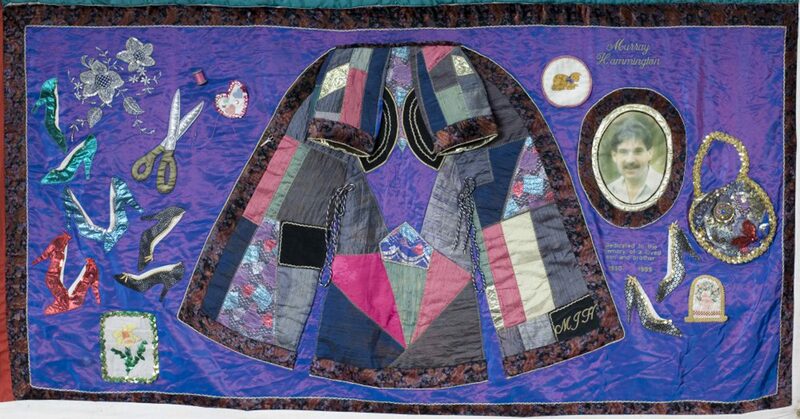 He was able to participate in the Unfolding of the Quilt at Parliament House in Canberra in August 1990, in the presence of the Governor General, Bill Hayden. Andrew regarded this event as the high point of his life. In April 1991, Andrew left Sydney to go back to his birthplace in Perth where he was cared for by his family. On June 10, 1991, this inspirational and truly remarkable man received another well-deserved honour. He was named in the Queen’s Birthday Honours List and received the Medal of the Order of Australia, for promoting community awareness of HIV and AIDS. Ten days later, on the twentieth of June 1991, Andrew died at home in Perth. Last issue I wrote a piece on the departure from the AIDS Council of one of the co-founding parents of PLWA Inc (NSW) and the PLWA [People Living With AIDS] movement in Australia, Terry Gilbert. This time fate has it that I write on the person I have known longer than any other. A person I have known longer than even his own mother – of course, he is my twin brother, my womb-mate, Andrew. Drew has moved back to Perth, where we were born in July 1954. His HIV illness has been complicated by mobility problems and he is moving in with our sister Anne and her family. Drew has been one of that special breed of person who has tirelessly worked in and for the HIV community since long before the bloody bug had a name. With close ties to San Francisco and New York, Drew and his friends experienced similar circumstances to the characters portrayed in the movie Longtime Companion. Friends were getting sick and dying and no-one knew what it was – let alone that the agent was a communicable disease. Drew was among the co-founders of the Community Support Network, the AIDS Council of NSW, People Living With AIDS (NSW), and was actively involved in other AIDS-specific groups. 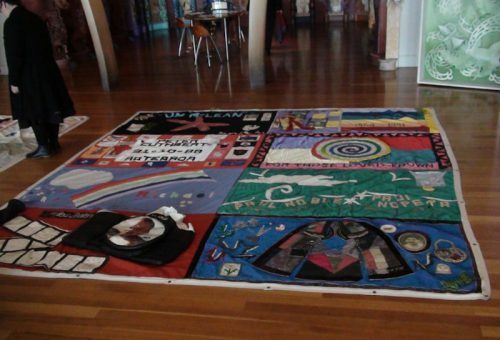 His most prominent achievement was to establish The Quilt Project, the Australian AIDS Memorial. On behalf of the many people living with HIV and AIDS in Australia who have had the privilege to meet or work with Drew, I’d like to thank him for his hard work and great determination in realising his beliefs. Likewise, on behalf of Drew and our family, I want to thank all involved in his care, his friends and his co-workers for their assistance, love and friendship. In a dramatic change from years in Sydney, San Francisco and New York’s high rises and horrid air, Drew will be living in a one level house in suburban Perth, close to the beach and fresh ocean breezes. What a special time we have had creating this panel for all those people we have worked with over the years. All very special, all unique, all loved and remembered. Their names are recorded on a piece of paper which sits inside the koru. Many of them were gay so we incorporated the pink triangle into the screen printed border. The background represents the four quadrants of every individual – spiritual, physical, emotional, mental – and reflects our strong belief in the necessity to focus on ‘wellness’ as a holistic concept, unique to each individual. The rainbow koru reflects the ongoing cycle of Life/Death/Life. We would like to thank Pam for sending us this information about this panel. 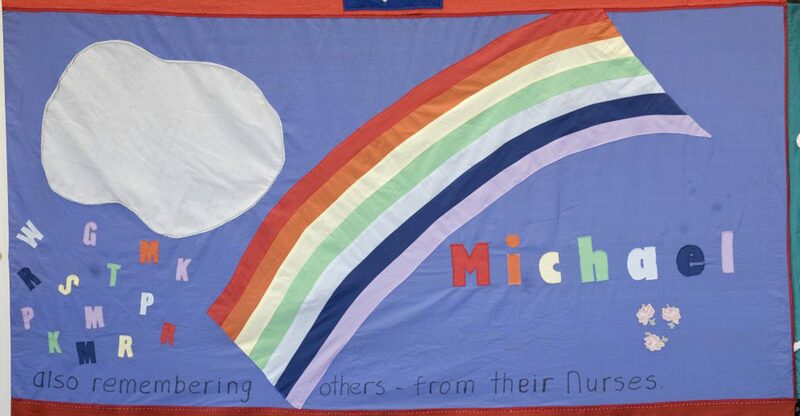 I am one of the Nurses who made the quilt for Michael. I’m not sure of the date but it would have been the late 1980s I think. In those days lots of people did not want to be identified hence the initials and not names and Michael’s family did not want his full name used. Sadly, at the time of setting up this website, we have no information about this panel other than it was made by his family. 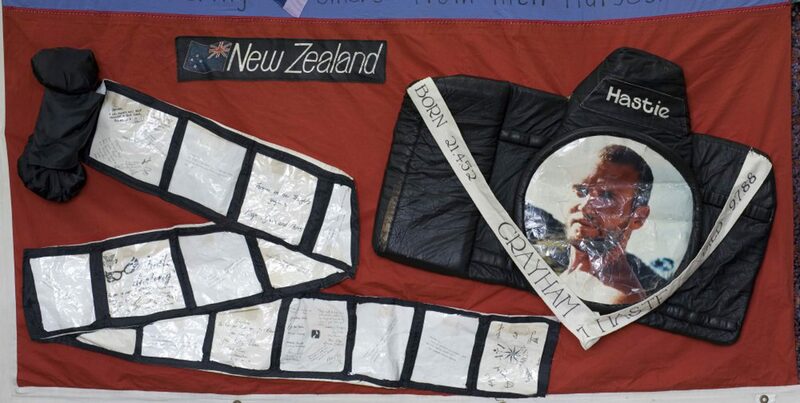 At the first Unfolding Ceremony of the New Zealand AIDS Memorial Quilt, 5th October 1991. 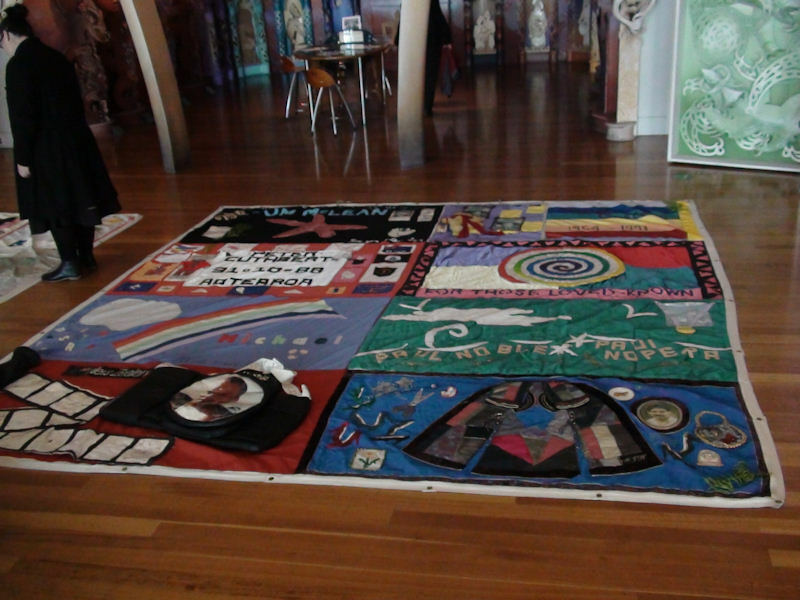 The block on display at Te Papa Tongarewa, the Museum of New Zealand, on the day The Quilt was formally welcomed to Te Papa, its new home.